I've been knitting along with the Kaffe Fassett afghan in the past few weeks. It started out as a mystery, but little by little, the mystery is being revealed. The pattern is free but you have to register on the Rowan website to get it. In the beginning we knew that there would be 63 squares and that each of the squares would be knitted 7 times. We were given the 4 colorways for each of the 9 squares. We also learned that all of the 63 squares would be knitted using the same directions. What we didn't know was the order of the 4 colors in each square. We also didn't know how they'd be pieced together. We were told that there would be no fairisle or intarsia. In week 5 (the current one), we were given a chart showing where the 63 blocks would be placed. What we still don't know is what clues 6 through 9 will look like. Videos and tutorials can be found on You Tube, here, including a spoiler in the newest video, showing the finished afghan. I haven't watched it yet and I'm not sure that I will. Maybe. Right now it looks like the brighter colors are collecting at the bottom with the darker ones at the top. Perhaps they'll balance out more when new clues are released. 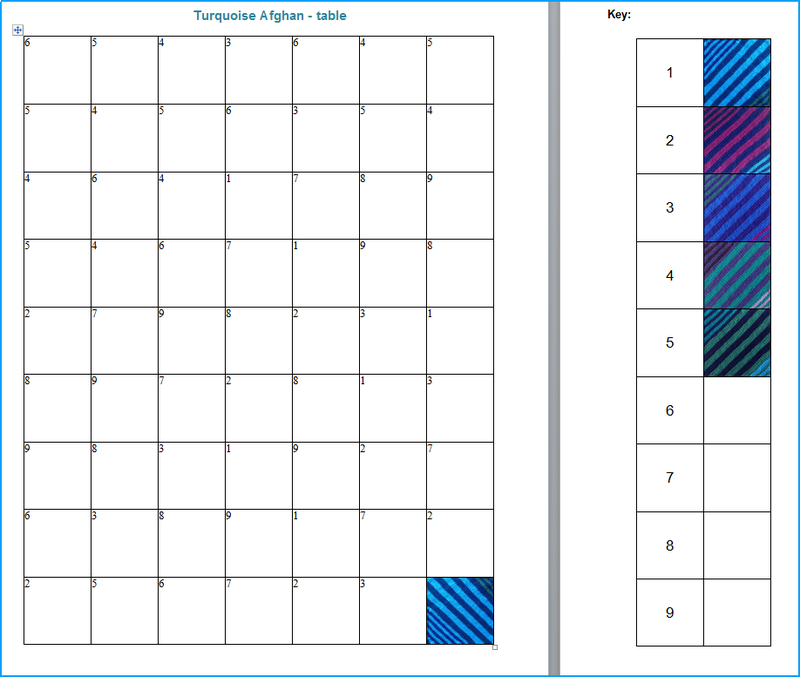 If you want a copy of the blank table (it's interactive), along with the key and directions, message me on Ravelry with your email address. I'll also send updates when new clues are released. I've only created the template for the turquoise version, by the way. This is a brilliant idea! You can start putting together the squares as you go...which is what I'd love to do...so I am going to COPY this LOL!!! I love how you've planned it all out like this - it's going to look stunning! Yep, you win the Technological Genius Kaffe prize!